Bedros Keuilian, CEO and Founder of PTPower, has just released his SEO Dominator in order to help fitness professionals starting a personal training business grow their business and add clients without breaking their budget. 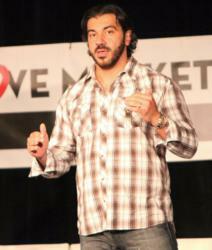 Bedros Keuilian, CEO and Founder of PTPower and the fitness boot camp franchise, Fit Body Boot Camp. ...what I like most about Fitness SEO Dominator is that the information in it is easy, direct, and step-by-step. Personal training marketing expert, Bedros Keuilian has just launched his SEO Dominator in hopes of helping personal trainers to add at least two to three new clients each week. Keuilian’s SEO Dominator features an in depth look at the complicated world of search engine optimizing and turns it into an easy to follow guide for any personal trainer to follow and optimize. The SEO Dominator includes three modules that gives fitness professionals starting a personal training business the tools they need to start optimizing their already existing website or blog right away. Module 1 features 15 different videos on subjects like keyword research and Web 2.0. Module 2 teaches personal trainers about Google Places and how to utilize it. And the third module features information on Google Adwords and its functions. "I recently set up the local listing dominator that I learned about in the Fitness SEO Dominator program and I quickly saw that my boot camp site is ranking in the number one and two spot for both of my main keywords, says Shawna Kaminski, Calgary’s top fitness trainer for women over 40. She adds, “what I like most about Fitness SEO Dominator is that the information in it is easy, direct, and step-by-step which really made it easy for me to hand off to my assistant and let her do all the SEO tactics to get my boot camp site to rank at the top of the search engines. " The Fitness SEO Dominator program also includes bonus materials to make sure that personal trainers have all the resources they need to rank number one on any popular search engine easily without being too time consuming.